Edward and Benjamin West Kilburn began their careers as a supplier of views of the White Mountains and New Hampshire scenery in the 1860’s. The brothers quickly expanded and by 1869 had a large plant with many titles for sale. When Edward Kilburn retired, Benjamin took over full operations including all photography. James M. Davis became associated with B. W. Kilburn in the early 1880’s and was in charge of distribution. He also acted as a photographer. Davis took over most of the day to day operations after 1901. The Kilburn Company never issued boxed sets, which may have been a reason for the company's decline. When it ceased operations in 1909, the company had produced 17,000 views and nearly 100,000 glass negatives (many variations exist for most prints). At that time the collection passed to the Keystone View Company. The Yellowstone history of this company has a few puzzles, but the distribution is pretty straightforward. Simply put, there were two series with multiple printings. The first was the 4,000 series of 1886 and the second, the 10,000 series of 1896. Though the actual dates of the photographs is unclear in many cases. The 4,000 series had three printings. They are numbered from 4246-4295, continuous. One printing has the Kilburn credit on the right side of the view, one has a lengthy informative text about the "act of Congress" on the right side, and one has no credit at all on the obverse. The 10,000 series appears to have had two printings. One has the James Davis credit on the obverse, and one does not. Numbering is from 10577-10611 and is also continuous. 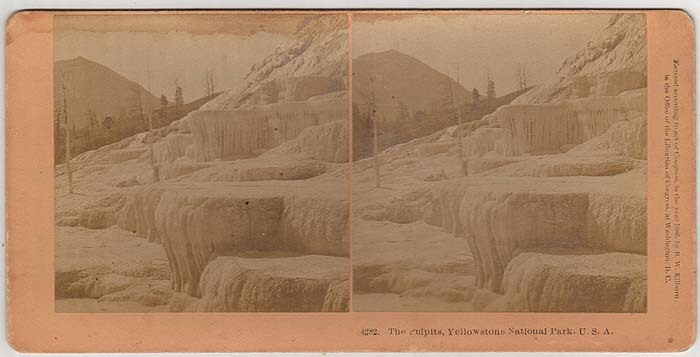 Three views numbered 4214, 4218 and 4220 are likely part of a general United States series and thus don’t fit in sequence with the other Yellowstone views of that era. 4246. Yellowstone National Park, Upper Geyser Basin. 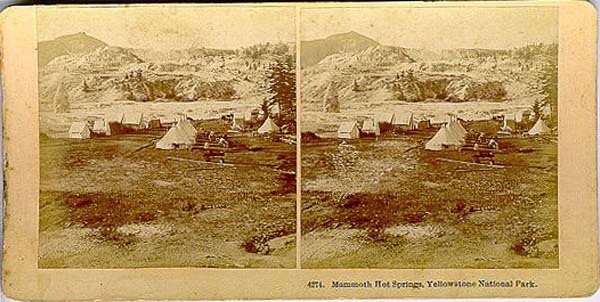 This great view of Upper Geyser Basin was published in 1886. It has the publishers credit on the right hand side only. The building under construction in the distance is a complete mystery. It was part of Kilburn’s 4000 series. 4274. Mammoth Hot Springs, Yellowstone National Park. Another 4000 series view of a tent campground at Mammoth. This printing had no publisher credit at all on the obverse. 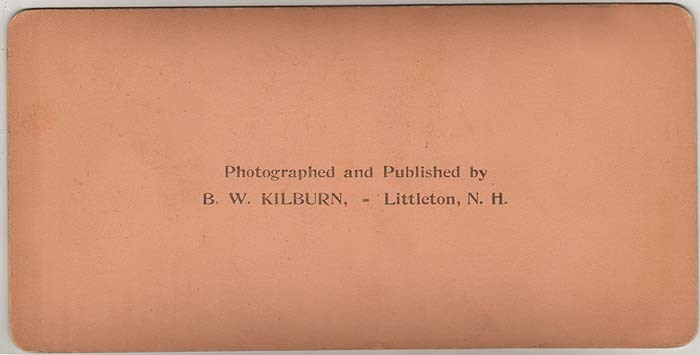 Only the reverse side was stamped with the Kilburn identification. 4282. The Pulpits, Yellowstone National Park. U.S.A. The most common 4000 series views are of this type with the Library of Congress credits on the right side. They too have the Kilburn stamp on the reverse side. 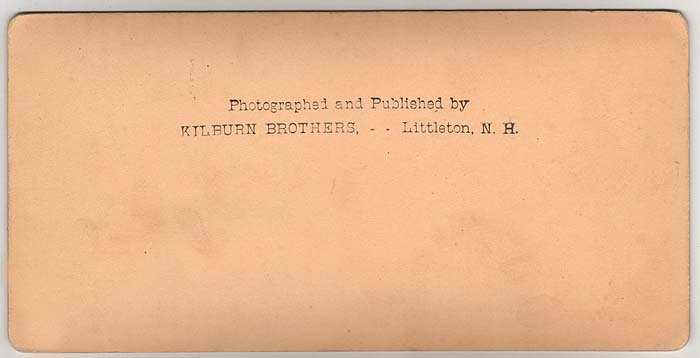 Less common views had the Kilburn Brothers stamp on the verso. 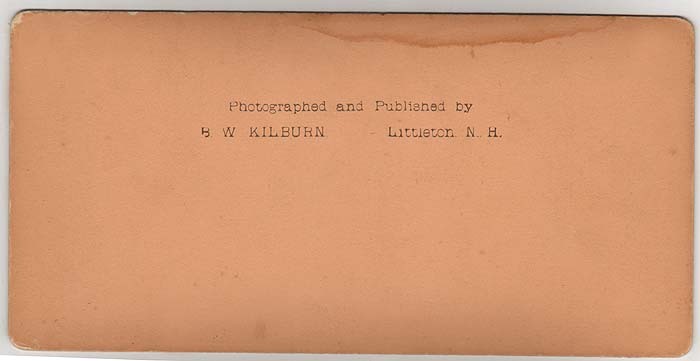 Most 4000 series views had this verso crediting only B. W. Kilburn. 10577. Bee Hive Geyser, Yellowstone National Park. 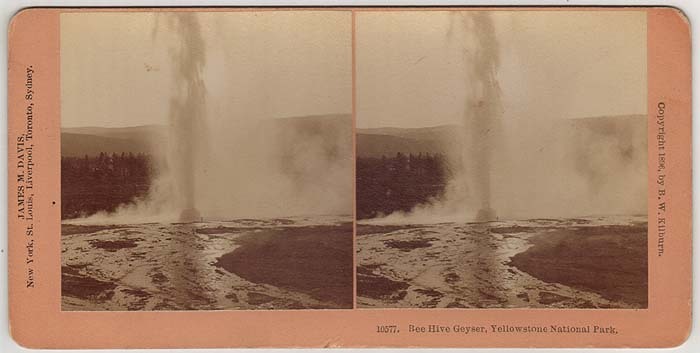 A view of Beehive Geyser in eruption. This 10,000 series view was published in 1896. It has the James Davis credit on the left side. It is the more common type of 10,000 series view. 10594. Great Falls, Yellowstone National Park. The less common 10,000 views had only the Kilburn credit on the right side and no mention of publisher James A. Davis. This image of a distant Lower Falls is such an example. All 10,000 series stereoviews had this style of verso. It credits only B. W. Kilburn and has a slightly different printing font than those of the 4,000 series above.